Located about an hour drive from Reykjavík in Southern Iceland, Hotel Rangá is a luxury countryside hotel and four-star resort. Nestled between the towns of Hella and Hvolsvöllur, the hotel offers deluxe accommodations, gourmet cuisine, and a range of upscale facilities and services, as well as breathtaking, panoramic scenery. 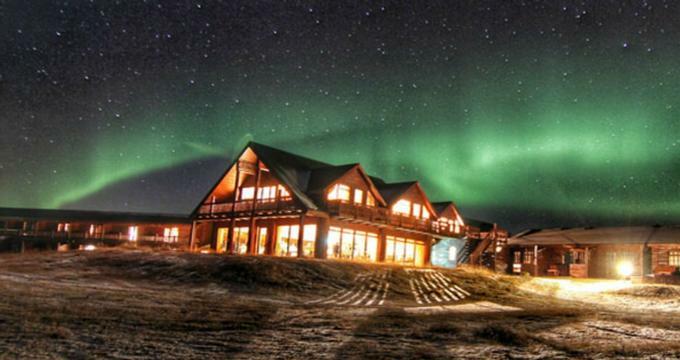 The prestigious international hotel and resort is built in a rustic log-cabin style and features a towering 10-foot tall polar bear named Hrammur in the lobby, which has become a well-known symbol for the hotel, which has become a top honeymoon destination and celebrity hot spot among Icelanders both in winter and summer. It is also ideally located for enjoying a variety of outdoor activities and Icelandic attractions, including the Glacier Lagoon (Jökulsárlón), the Golden Circle, and Eyjafjallajökull. Hotel Rangá features 51 luxuriously decorated non-smoking guest rooms and suites, ranging from standard guest rooms to renowned continental suites, which are decorated and themed after the continents, and a luxurious master royal suite. Designed to provide the ultimate sanctuary in which to relax, each room and suite feature deluxe queen or king-size beds with designer linens, and en-suite bathrooms with walk-in showers and/soaking tubs, plush towels, and organic bath products. Modern amenities include flat-screen televisions, telephones, coffee makers, minibars, laundry services and complimentary wireless Internet. Hotel Rangá offers 24 standard guest rooms that are 18 square meters in size and boast views of either the East Rangá River or the famous volcano Mt. Hekla. Six of the guest rooms feature queen-size beds with designer linens, and 18 guest rooms have twin beds that can be converted into doubles if required. Hotel Rangá has 20 deluxe rooms that are 26 square meters in size and offer higher levels of comfort and luxury that the standard guest rooms. Seventeen elegant rooms have king-size beds, while three of the bedrooms have twin beds that can be converted into doubles if required. Deluxe rooms have beautiful views of the Mt. Hekla volcano or the East Rangá River. Located on the second floor, luxury suites are unique, designed and decorated after the seven continents of the world. Providing guests with sanctuaries that are ‘worlds apart,’ suites range between 40 and 74 square meters and feature designer furnishings, original artworks, king-size beds with luxury linens and en-suite bathrooms with walk-in showers and Jacuzzi tubs. Junior suites are named after Asia, Australia, North America, and South America, while Master suites include Africa, Antarctica, and the Royal Suite, which boasts beautiful views of the East Rangá River and Mt. Hekla. Boasting an elegant riverside setting that is the perfect spot for an exceptional dining experience, the Rangá Restaurant is one of Iceland’s leading gourmet destinations. Overlooking the East-Rangá River, one of Iceland's most beautiful salmon rivers, the restaurant serves a Nordic-inspired menu of innovative, sustainable and seasonal cuisine. The restaurant is open for breakfast, lunch, and dinner, and there is an elegant wine bar that serves an array of hand curated wines from around the world. In addition to the 51 luxuriously decorated guest rooms and suites, Hotel Rangá also features an acclaimed fine dining restaurant with riverside views, an elegant lounge and bar, modern meeting and function facilities, a games room and massage and spa services. The hotel has three outdoor hot tubs with geothermal water and fantastic views, particularly of the Northern Lights during September through April. It also has a first-class observatory for stargazing. 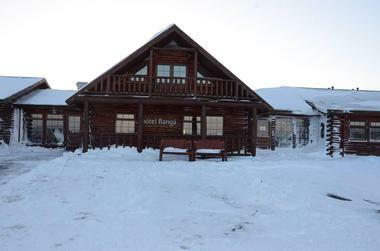 Hotel Rangá is ideally located for exploring and experiencing all the best that South Iceland has to offer, ranging from well-known attractions such as the Northern Lights, the Golden Circle and the Glacier Lagoon to adventures and activities, such as hiking, glacier hiking, horseback riding, and ice-fishing. Hotel Rangá offers the perfect setting for weddings, honeymoons, anniversaries, birthday celebrations and other events, along with specialized services such as wedding and reception planning, catering services, and more. The hotel is perfectly located for beautiful photographic opportunities, as well as exploring all that attractions and activities have to offer. 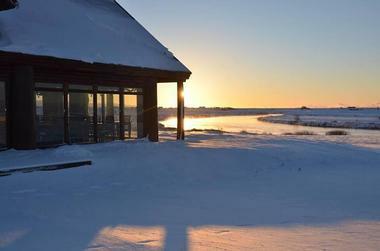 Hotel Rangá is ideally located to explore the Icelandic highlands and the magnificent natural scenery, which includes black sand beaches and fishing villages, glaciers and volcanoes, majestic waterfalls and hot springs, historical places, cultural centers and nature preserves. 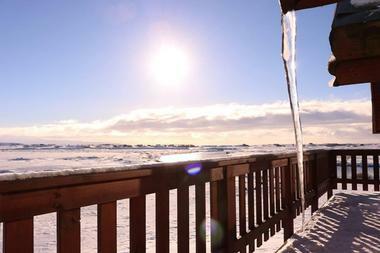 Notable attractions include the Northern Lights, the Glacier Lagoon, and the nearby Eyjafjallajökull.